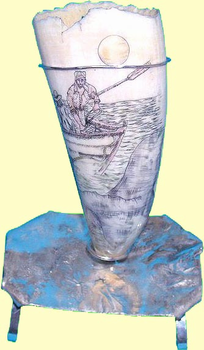 The scrimshaw on this Sperm Whale's tooth shows a scene just after the harpooneer has fastened to the whale. He is gathering in the line preparatory to putting it around the loggerhead, while the whale is diving. The bow of the whaleboat and one crewman is also shown. The harpoon is shown and the whale's tail is in the process of flipping. This tooth is beautifully curved. It is 5 inches long around the curve, and 1 3/4 inches wide at the base. The scene is etched with just a hint of color with the bottom side up to better take advantage of the wide base. The tooth is mounted bottom side up on a handmade sterling silver base whose platform is reticulated to look very much like the ocean waves etched on the tooth. The tooth is secured by two hoops and is removable from the base. The back of the tooth is left natural to show the original surface before polishing. This is, of course, a legal Sperm Whale's tooth registered as number 21-132. It weighs 106.5 grams. is a superb tooth classically etched and it will be a centerpiece of any collection. It is signed and etched by M. M. Cohen. Of course, only one is available.